Bad weather scares you off from running? There is no bad weather, only bad clothes. Come to love winter workouts with the right gear. The trick is wearing your workout clothes in layers. You need enough layers that you’re not shivering from the cold, but not so many that you’re sweating. Here’s our guide to knowing what—and how much— to wear so that you can get your run done regardless of the weather. Start with your base layer, which is undergarments, socks, and the first layer of clothes (tops and bottoms) closest to the skin. This layer should be made of of the material that pulls moisture away from the skin. These technical fabrics might cost more than cotton, but are worth the extra expense for the comfort they provide. The insulating middle layer should be loose enough to trap air between layers, but not so heavy that it restricts movement; this layer should fit comfortably, offering you maximum range of motion for your workout. The outer layer acts like a shell to keep out wind, rain and snow. This layer will depend on the weather and your comfort level. Whatever your preference, this layer should be protective (waterproof or water resistant), but also breathable enough that sweat can still evaporate so that your body doesn’t overheat. Water-resistant clothing (nylon is a good option) can be a better choice than waterproof. Although waterproof will keep you totally dry, it’s not very breathable and can make moisture under your clothes more of an issue. Waterproof an be a safest option if it’s a mix of cold temperatures with rain or snow. We lose the majority of body heat through our heads, so a hat is a good idea when exercising on a cold winter day. In fact, you might find that you don’t need as many layers of clothing because of the warmth a good hat can provide. 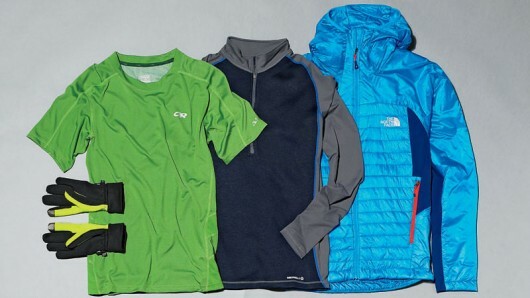 Chose sweat-wicking, waterproof and breathable fabrics. Mittens are generally warmer than gloves, but offer less dexterity, so consider the type of activity you’ll be doing. Don’t buy too tight gloves or mittens. You need a bit of air space at the tips of your fingers to act as additional insulation. A Good option is a lightweight stretchy gloves for cool days, and thicker gloves for when the temperature dips much lower. Investing in a quality pair of gloves or mittens for different weather conditions. On your legs, you can layer the same way you would dress your upper half, but most athletes will find that their extremeties stay much warmer than their cores. You should feel slightly chilly for the first few minutes of your workout since your body will start to heat up as you get moving. 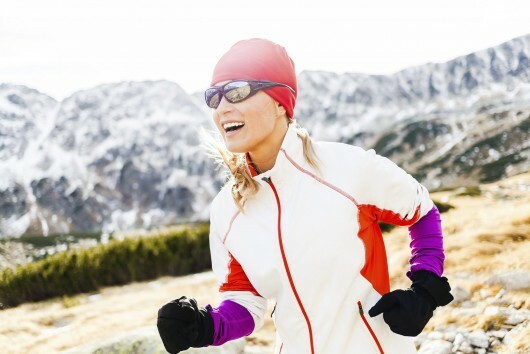 Being comfortably dressed during your outdoor workout will keep you motivated to stay active all winter long. 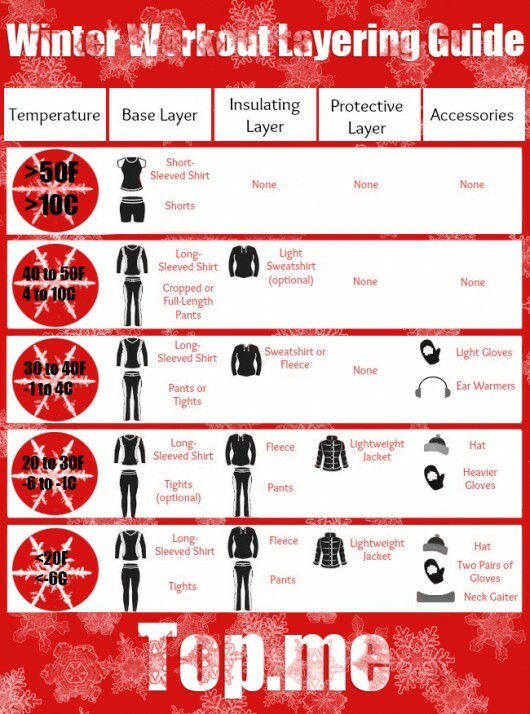 Here is a Winter Workout Layering Guide for you to download.